Welcome to the Spring Fling Series! We are thrilled to be kicking off the week with two sisters, just like us, from one of our favorite blogs- Lolly Jane! We absolutely LOVE their style and creativity! I've been a guest over there, and I've even had the chance to meet these two in person- and they are so fun and so nice! So- without further ado, let's get this thing started! To quickly introduce ourselves, we're twin sisters Kelli and Kristi from Lolly Jane, our DIY/home improvement blog where we share tips for painting and redoing furniture, holiday crafts, creating home decor on a budget and once in a while, we'll even share some tasty desserts along the way. And every so often you will see our older sis Sandee (we've nicknamed her our manager since she coordinates our quarterly craft nights) on LJ, like today! 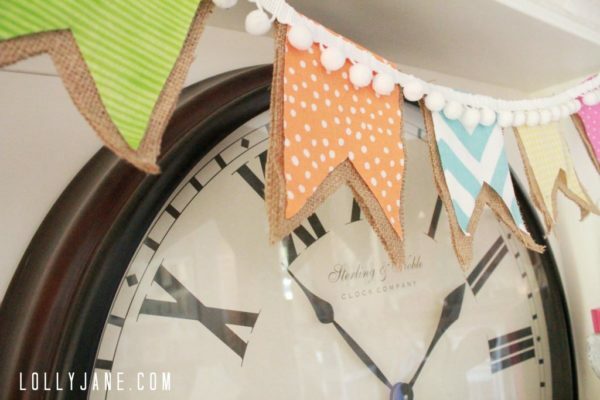 We love her style and are happy she let us raid her house to share her pom pom burlap bunting that we will soon be knocking off (; It's easy peasy to create and is oh-so-springy and fun! Simply cut the burlap into a pendant shape and fold; cut the fabric slightly smaller (feel free to use our template provided above, although we free handed ours. Perfectly imperfect! LOL) String some bakers twine between the fold of the bunting then hot glue the pom pom strand across the whole bunting. Simple but makes the space so cheery! 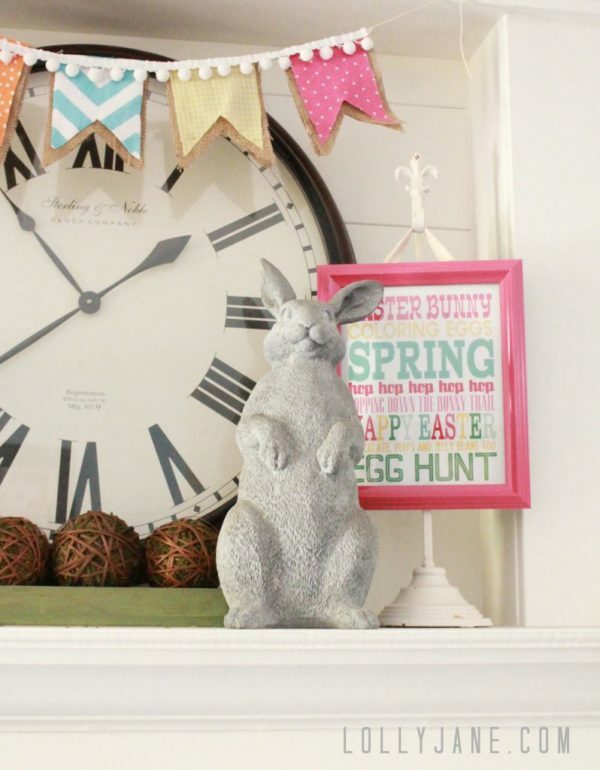 Sandee's mantel is super cute paired with our Shanty-inspired apothecary jars, framed eighteen25 printable, our foam Easter egg sign and Kelli's recent bunny thrift store find. Sandee and I both tried to bribe her to snag that bunny but she's playing for keeps! Thanks ladies! That banner is seriously adorable- and I must make one RIGHT NOW! We are truly honored to have you here on the blog today! Now, it's time to announce our Spring Fling Giveaway. 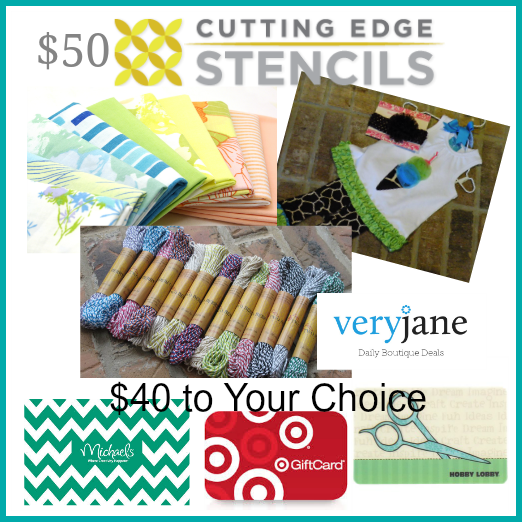 Some of our favorite companies and sponsors have teamed up to offer you $200 worth of goodies! Good luck and make sure you drop by later today to learn more about the prizes being offered! I love spring for the pretty colors all around, and I don't have to wear socks anymore! So fun! THANKS for including us! My fave thing about spring is finally opening the windows in the house and listening to the birds "chatting". The sun and the warmth immediately improve my mood! Having a chance to get outside and get my hands in the dirt! I love all the flowers and sunshine! I love the spring flowers, like tulips, sprouting from the ground. It always feels like life is renewed. Such an adorable banner. I love the pom poms! I love my fresh herbs and tomatoes! Flowers, and being able to open the windows with a spring rain. Smells so good! Favorite thing about spring -- gardening in mild weather and watching seeds sprout. I love seeing all the beautiful flowers on the ground and on the trees! My favorite thing about spring, or at least one of them, is daffodils! Love to see those cheery looking flowers after the drabness of winter. My two favorite things about spring are seeing the kids playing outside all the time, and getting my garden planted. Getting outside after being couped up inside all winter! My favorite thing about spring is daffodils. My favorite thing about spring is no more shoveling and ice scraping! I have have an extra half hour or so every day for crafting! I love seeing the GREEN grass again and walking out of the house in the morning and smelling that spring air! My favorite thing is starting the garden and the smell of the clean fresh air! The birds. You can hear them singing in the mornings. Being able to spend more time outside especially laying down on a blanket and watching the clouds! My favorite thing about spring is all the spring flowers, the fresh air, opening up my windows and green coming back! Love the first 70 degree day! My fav thing about spring is watching my everblooming hydrangeas coming to life...from one warm day to the next I love seeing them sprouting! Planting flowers and herbs, love to watch them bloom. Being able to open the windows, planting flowers, green grass. My favorite part of spring new life, spring green, warm sunny days! My favorite part about Spring is the flowers and budding trees. Singing birds and being able to open the windows! i love all the blooming flowers! I love when the flowers begin to bloom and the earth comes alive in green! My fave thing about Spring is gardening.